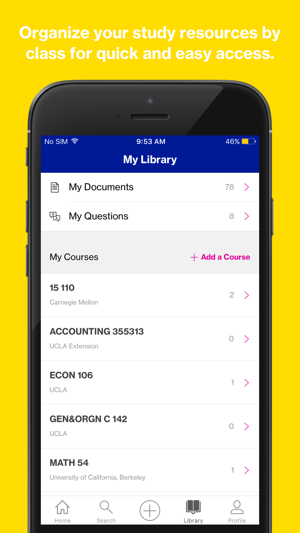 Course Hero | Get Homework Help with Course Notes, Flashcards, and Study Guides. Study smarter with the largest online library of course notes, flashcards, study guides, and homework help—available 24/7. Better grades guaranteed! Unlock the exact course notes, study guides, and test prep you need from more than 10 million students and educators at 16,000 schools. Get step-by-step help from expert tutors anytime, anywhere. Create flashcards to master the course material and share with your friends! Earn better grades when you study with millions of course notes, flashcards, study guides, test prep, and more from students and educators at 16,000 schools for the 2017-2018 school year. Search for your school and course or get help from study resources at other schools. Once we learn about the subjects you’re studying and courses you’re following, we’ll even send notifications when we have new and helpful resources. Need personalized homework help? Find answers to your questions with homework help from expert tutors who are available online 24/7. Message back and forth until you understand the material and get to the answers you need. Quality answers or your money back! Flashcards are a simple yet effective way to learn new material and retain knowledge. Create flashcards or find existing flashcard sets to help you master material before your exams. Share flashcards with your friends and classmates for an effective and collaborative study experience. 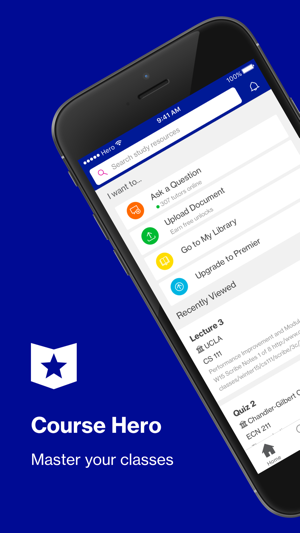 Save class notes, Q&As, flashcards, and more to your library to stay organized this year. 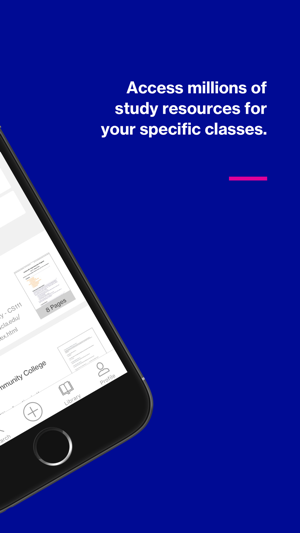 Your library is organized by course and is accessible via the app and via the Course Hero site for free in your browser so you can always find what you’re looking for. Never misplace your study materials again! -Maximize your study time and earn better grades! 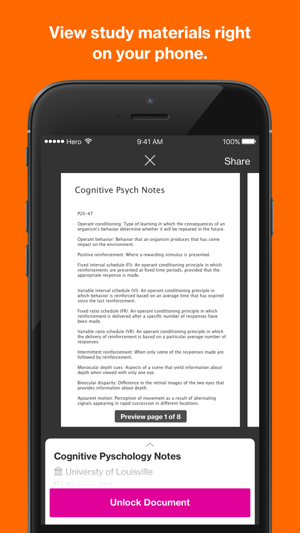 -Study millions of course-specific documents: course notes, flashcards, and study guides. -Get fast and detailed homework help from online tutors 24/7. -Find existing flashcards or create your own to share with friends. -Study right away or save materials to your library to read later. -Have easy offline access to resources you’ve previously viewed via the app. -Get notifications for new resources—based on your previous searches. People without a Premier subscription will still be able to search, save, and view previews of more than 10 million course-specific documents: course notes, study guides, and Q&As. And they’ll be able to get homework help from Course Hero tutors and utilize all flashcard features. For full access to Course Hero’s high-quality study documents, users must upgrade to a Premier membership. For Customer Support, please visit support.coursehero.com/hc/en-us. We’re happy to help! Payment will be charged to your iTunes account at confirmation of purchase. Subscriptions renew automatically unless canceled more than 24 hours before the end of the current subscription period. You may manage your subscription and turn off auto-renewal by visiting Account Settings in iTunes, but you cannot cancel an existing subscription before it ends. We've enhanced our cancel question flow and performed misc. bug fixes. Happy Studying! I downloaded the app expecting at least SOME free content, but that would have been too easy. So I paid the year subscription which is really just paying for 30 unlocks...which if you want an additional 30 is $70...I have yet to find anything but actual answers to tests (so still making my own flash cards) or other people’s essays and answers. It’s not anything advertised for the free app and even after you pay for it you still don’t get full access or maybe not even what you’re looking for. I canceled my subscription within minutes and emailed within a half hour asking for a refund. I didn’t use any unlocks as none of the content offered matched what I was looking for, I have yet to hear back. If you want free flash cards use quizlet. They have premium options too that I haven’t explored, but if I wanted to it’s significantly cheaper. So far I’m getting better help for free from a different app. If you’re a college student you’re better off spending your money on an actual tutor, or food. I find the now one month and three month subscription price to be ridiculous. Also never liked that you have a number of unlocks uses each month and have to use that to unlock the document. But I can understand why it’s like that. Wish that the uploads would go through a good review process. One time I unlocked a study guide but it only showed the answers for the questions that showed on the preview. The rest was blank. Also for the last couple of months a lot of times the preview for the documents won’t even show up. But I do find a few documents that are extremely helpful which is why I’m going to keep the app. But wish Course Hero would fix the preview issue. Also I haven't been able to view my recent unlocks when I go to my documents. So I have to search for them again which is very annoying. Thanks for your feedback. 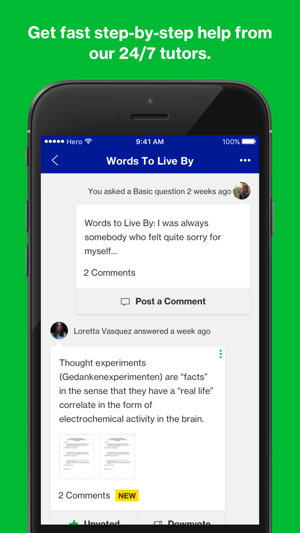 We’re always looking for ways to improve our app and would love to hear more of your thoughts. If you have a few minutes to share more feedback, please email support@coursehero.com. We’re sorry to hear that the app didn’t provide the help you were looking for! Please let us know how we can do better at support@coursehero.com. We’d love to hear from you. © 2018. Course Hero, Inc.